Here’s a life lesson for all children (and parents too): It’s OK to make a mistake. In fact, better than ok! Beautiful Oops! shows young readers how every spill and smear, stain and tear, is an opportunity to make something beautiful. Filled with pop-ups, lift-the-flaps, tears, bends and smudges, it’s a joyous book that celebrates the journey from blunder to wonder. 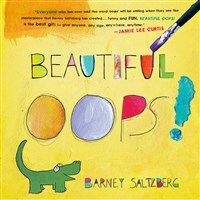 Barney Saltzberg is the author and illustrator of close to 50 books for children, including Beautiful Oops!, Arlo Needs Glasses, Would You Rather Be A Princess or a Dragon?, and the bestselling Touch and Feel Kisses series. He lives in Los Angeles with his wife and two dogs.